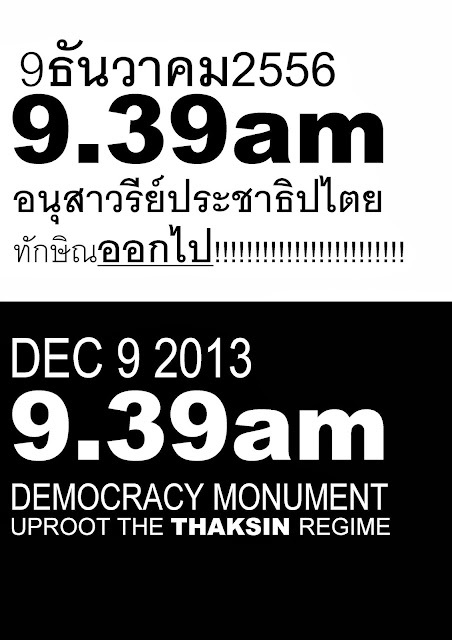 For the second time during recent anti-regime protests, a mass mobilization is planned to begin this Monday, December 9, 2013 at 9:39am at Democracy Monument. Universities across Bangkok are setting times and locations for pre-rally staging. Protesters who individually attended the last mobilization, the largest in modern history, are better organized for this coming Monday – gathering their own smaller groups to join larger staging areas for a mass march across the city. According to even the Western press, who has thus far attempted to shelter the Wall Street-backed regime, at least 200,000 protesters filled the streets last month, dwarfing entirely anything the regime has ever accomplished even at the height of its popularity. Since then, the regime has used excessive force, made draconian threats, and even unleashed armed militants to create bloodshed – further alienating itself, and galvanizing the Thai people. Many of the individual pre-mobilizations will be as large as a typical pro-regime rally. These will then march across the city and merge. The last mass mobilization was peaceful, even festive. This Monday, the message is a non-violent one, for the regime to see and hear the voices of the people who reject it wholly and will no longer comply with its entrenched, abusive power. Video: While the regime uses camera tricks to “fill” even a single stadium, this was taking overhead of last November’s mass-mobilization, near Bangkok, Thailand’s Democracy Monument using a camera drone. The protesters can be seen stretching out in all directions. Other roads were similarly filled. This Monday, December 9, 2013, Thais will have another chance to participate in a similarly unprecedented gathering. 1. Do participate! Do not be afraid of rumors of violence, nor allow empty regime threats to deter you. That the regime attempts to discourage free speech is all the more reason to come out and topple it. 2.Contact other like minded people today. Pick a place and time BEFORE 9:39am this Monday, to meet and set off for larger pre-rally locations. Many universities across the city are serving as starting points including: Ramkamhaeng, Mahidol, Kasetsart, King Mongkut Institute Thinburi, and Thammasat (Tha Prachan) University. Other universities are giving their tacit support by closing on this Monday, December 9, to allow students to participate. 3. Bring water, a hat, and comfortable shoes. Eat a decent meal before going out as you will be doing a lot of walking and may not have an opportunity to eat until later on. 4. Bring a smart phone or a camera to both photograph and record the event (and any incidents), as well as to publish them live to social media (Facebook, Twitter), blogs, and websites. If you don’t have a Twitter account, make one before Monday. In each message, ensure that you type hash tags such as #Thailand #Bangkok and #Dec9Rally.